The Jayhawkers! is a 1959 American Technicolor VistaVision film directed by Melvin Frank, starring Jeff Chandler as Luke Darcy and Fess Parker as Cam Bleeker. The film is set in pre-Civil War Kansas. Darcy leads a gang which seeks to take advantage of Bleeding Kansas (loosely based on abolitionist John Brown; Bleeker joins the gang. The supporting cast features Henry Silva and Leo Gordon. The world has changed in eight years. This is no time to satirize western myth; people won't stand for the making fun of something sacred. 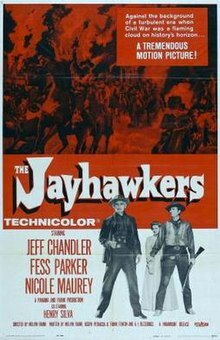 Actually, why The Jayhawkers is in the outdoor category and has outlaws and guns and horses, it's a western only in that it takes place on the then-frontier of 1859. Something frightening happened in Kansas on the eve of the Civil War... A man on horseback tried to become A Man on Horseback. He took over only a few towns- but what would've happened if he'd seized Kansas for his empire and the Civil War had allowed him to set up a kingdom in the West? The power mad character has always threatened freedom. We had long wanted to use this theme in a story about the American past and when we found this story... it clicked. Panama and Frank subjected the script to analysis by a psychological consulting firm. Melvin Frank tried to interest Vivien Leigh in the female lead. Chandler made the film on loan out from Universal International. Filming started 1 December 1958. ^ MOVIELAND EVENTS: 'Jayhawkers' Quest Ranges East, West Los Angeles Times (1923-Current File) [Los Angeles, Calif] 29 June 1957: B3. ^ PANAMA, FRANK HAVE BUSY SLATE: Team Plans 6 Productions for Paramount -- Army Aiding Peck on Film By THOMAS M. PRYOR Special to The New York Times.. New York Times (1923-Current file) [New York, N.Y] 10 Apr 1958: 32. ^ QUINN TO DIRECT A MOVIE MUSICAL: He Will Work on 'Buccaneer,' De Mille Film in Which He Acted in 1938 Version Fox Seeks 'Rock Hunter' Star By THOMAS M. PRYOR Special to The New York Times.. New York Times (1923-Current file) [New York, N.Y] 31 Jan 1957: 21. ^ Pair State Nobody Will Go Thataway: Panama, Frank Serious About West They Kidded in 'Callaway' Scheuer, Philip K. Los Angeles Times (1923-Current File) [Los Angeles, Calif] 06 Jan 1959: D11. ^ FILM TEAM SEEKS AID OF PSYCHOLOGY: Panama and Frank to Study Reactions to 2 Scripts-- 'Big Fisherman' Bought By THOMAS M. PRYOR Special to The New York Times.. New York Times (1923-Current file) [New York, N.Y] 24 Oct 1957: 37. ^ MOVIELAND EVENTS: Kansas Schoolma'am Broached for Leigh Los Angeles Times (1923-Current File) [Los Angeles, Calif] 31 July 1957: 23. ^ Thomas Pryor, 'GOLDWYN NAMED FOR MOVIE HONOR: PRODUCERS GUILD TO GIVE HIM MILESTONE AWARD -JEFF CHANDLER GETS ROLE', ''New York Times (1923-Current file) [New York, N.Y] 21 Oct 1958: 38. This page was last edited on 21 September 2018, at 06:41 (UTC).